A few days ago, Super Minipla King Brachion(AKA: Titanus) made his grand debut at the All Japan Hobby Model Show, where Bandai announced that this bad boy will run you the astronomical price of 12,960 yen. Since his debut, pre orders for this massive beast of a model kit is set to begin, and with that pre-order some new details have been revealed that might explain why this costs as much as it does along with showcasing the impressive fully combined Ultra Zord mode. A post from https://www.facebook.com/Tokullectibles]Tokullectibles mentions that it takes AA Batteries, from translating the pre-order page we can confirm that the kit will have electronics for some sort of motorized gimmick. None the less, pre-orders for Super Minipla King Brachion will begin October 5th, 2017 with a final shipping date of February 2018. 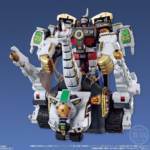 In case you missed it, Bandai’s Super Minipla line was gearing up to release the big carrier Zord himself: Super Minipla King Brachion/Titanus . We finally have our first look at the fully completed prototype with photos and release info coming straight from the All Japan Model Hobby Show. While we don’t have any photos of the combined Ultra Zord mode, we do have an idea of when Bandai plans to release this bad boy: pre-orders for this model kit will begin in October and will ship sometime in January 2018. The cost of all this plastic? A whopping 12,960 yen before any shipping fees. 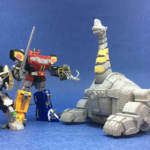 Rounding out our trio of Zyuranger Minipla releases, Bandai’s Candy Toy blog was just updated with our first look at the Super Minipla King Brachion/Titanus! No release info was provided in this post given that it’s still clearly in early development. But given that his size and price point matches that of Super Minipla’s King J-Der from GaoGaiGar, we can expect this to be a potential Premium Bandai with a similar price tag of 10,000 yen. 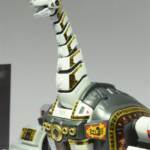 Mirroring what happened with the Legacy Dragonzord before it’s release, Bandai UK has just revealed brand new in hands images of the upcoming Legacy Titanus! This whopping behemoth will retail for $200 at Toys R Us this fall, and as you can clearly see is meant to be combined with the previously released Legacy Megazord & Dragonzord to complete the Legacy Ultrazord! 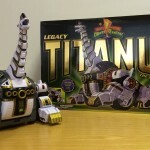 If you can’t tell already Titanus is huge and apparently very heavy. Be on the lookout for this bad boy on TRU shelves in the coming months!